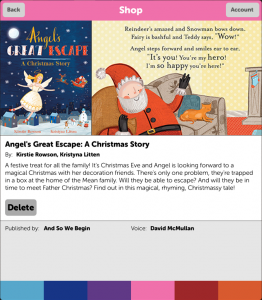 There's much excitement at And So We Begin central today as Angel's Great Escape, written by Kirstie Rowson and illustrated by Kristyna Litten, is now live on Me Books! We are very proud to feature alongside such classics as The Snowman and the Snowdog, Charlie and Lola and Peter Rabbit! Me Books is an independent eBookshop for children aged 2-10 where you can buy all your favourite books, comics and bedtime stories via one award-winning app, all with fantastic read-along narration. You can also record your own narration and sound effects to create a truly personal library on your phone or tablet. The Me Books version of Angel's Great Escape includes not only brilliant narration by David McMullan but he also voices all SEVENTEEN (count them!) characters. Hear Mr Mean grumbling, Mr Good spreading Christmas cheer, Angel encouraging her friends, the decorations as they dash through the snow and even Father Christmas enjoying a mince pie! Here's just one small example from the little Teddy decoration from the story. 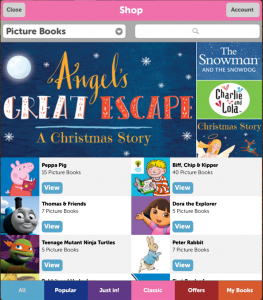 Download the Me Books app and buy Angel's Great Escape to hear lots more!